As soon as the heavy door clicked closed behind him, he pinned me to the wall with a hard kiss. I let myself pull him close and melt into him, savoring our aloneness. I forced my mouth from his so I could talk. "For the record, you can play guitar for me anytime." Dark hair hung in his eyes as he loomed over me, so hot. Oh, yes. I'm so enjoying Sweet Reckoning. Love Kai. Love Kai and Anna together. So yummy. What do you think? He smiled against my finger and pulled my hand down. "Promise. But you do know, right? How I feel about you is... You're so funny and amazing and sweet and beautiful. I was half a person before you. You make me feel like everything in my life has been for a reason. I'm just happy that I-"
I stopped him with a kiss because I knew and didn't need to hear it. I felt him chuckle as he pressed closer, pinning me against the tree, my hands on his chest between us. I'm re-reading this series this month, since it's one of my favorites to revisit, and I am so enjoying falling in love all over again. This book, series, and Caleb & Maggie (plus all their sweetness), make me feel all kinds of happy! What do you think? Ohh Sweet Reckoning was so swoony! Kai and Anna together are awesome. 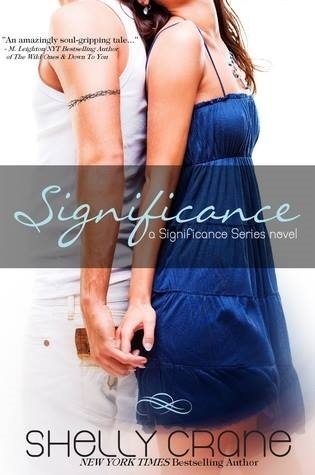 And Significance is probably one of the sweetest books ever. Love both swoons!